FORT MYERS, FL, UNITED STATES OF AMERICA, September 12, 2018 /EINPresswire.com/ — SubscriberWise, the nation’s largest issuing CRA for the communications industry and the leading protector of children victimized by identity fraud, announced today the desperate plea from Pro Se plaintiff and ‘ding and dent’ victim David Howe to the Florida Supreme Court. The desperate plea is for the State’s High Court to review the lack of due process in Howe vs. Enterprise Holdings, Inc., in the County Court of the Twentieth Judicial Circuit in and for Lee County Florida. The 'trial' was held on August 22, 2018, in Fort Myers, Florida, Honorable Archie B. Hayward, Jr.
“Today I’m pleading with Florida’s highest court to urgently review the ‘small claim’ due process in Judge Archie B. Hayward Jr.’s Lee County Courtroom. Specifically, I would like the seven justices to know that an attorney representing a tortfeasor was able to successfully suppress the most critical evidence of the case prepared diligently by the Lee Port Authority Police and containing sworn witness statements from the very individual who testified in front of Judge Hayward. “Yes, it was so frustrating to be in a courtroom and not know how to present any of the evidence that I previously docketed with the court. I never imagined in a million years that a small claim plaintiff representing himself would not be able to use any of the evidence previously provided to the defense. “Indeed, I successfully submitted the sworn testimony to the court electronically – the complete and official Lee Port Authority Police report among a comprehensive array of other items of evidence — just as I was instructed by Enterprise counsel regarding all evidence for trial. Remarkably, I was unable to present to the court any of the mountain of evidence except a single audio recording (https://soundcloud.com/user-370781554/national-car-rental-damage-recovery-scam) proving an illicit money pursuit. I even made prior arrangements with Judge Hayward’s assistant, informing her that I would have audio and video evidence that was submitted on the docket; she ultimately arranged for a pre-meeting ahead of trial with a technical employee from the court who helped setup the computer technology for the audio and video evidence expected for trial. “For the record, the very evidence that I was unable to present at trial…it's still on the Lee County Court Docket for the world to see,” Howe proclaimed. “Just imagine for a moment my shock and surprise when I discovered I wouldn’t be able to present a shred of any of the overwhelming evidence to easily prove the facts of the case,” Howe emphasized. “Is this what we call DUE PROCESS in America? How could it be that the merits of a case could be lost to strict technical guidelines of civil procedure in a SMALL CLAIM trial? “And I am convinced that Judge Hayward was doing his best trying to help me overcome Attorney Citron’s repeated objections to hearing the facts contained in the police report and sworn witness statements, I just didn’t know how to accomplish the goal; I tried and tried in vain and it’s all contained in the trial transcript. “Of course there's no doubt that Attorney Citron was extremely worried and very concerned about the contents of the police report, including the witness statement. In fact, it seemed that all he could manage to utter was ‘HEARSAY’ AND ‘OBJECTION’. ‘HEARSAY’ your honor! ‘OBJECTION’ your honor! “Yes, Attorney Citron just didn’t want Judge Archie Hayward to lay an eye on the police report. And for obvious reason to anyone who has read it. But he certainly accomplished his goal by taking advantage of the unfair playing field in the SMALL CLAIM court. “I just never expected that a ‘small claim’ hearing would require such an extraordinary effort to simply cover the merits of the case versus the complicated civil procedures that are reserved for the regular civil docket. 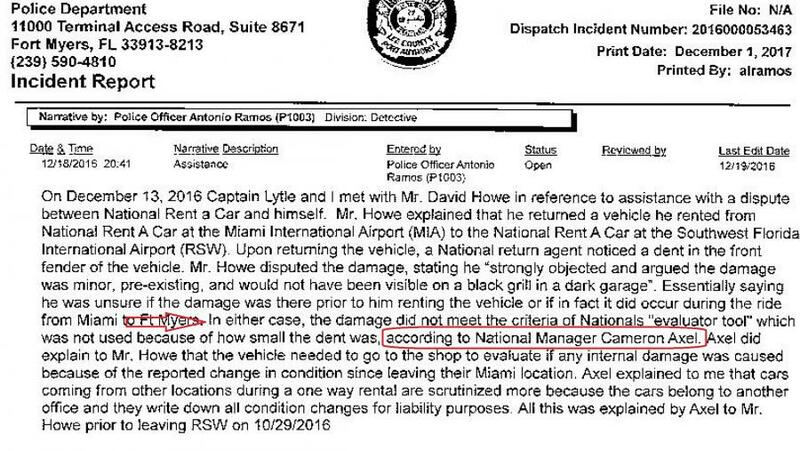 “I also couldn’t imagine why an attorney for Enterprise Holdings National Car Rental would be so fearful in a ‘small claim’ hearing to simply allow the plaintiff to read into the record the sworn testimony from the police report. I couldn’t imagine why the attorney would simply not let Judge Hayward take a minute to read the facts exposed in the police report,” Howe quipped rhetorically. “After all, what is Enterprise Holdings’ National, Alamo, and Enterprise Car Rental trying to conceal from the public record? “What is this Enterprise company really doing to individuals who rent their cars in the state of Florida and elsewhere? “Surely, Enterprise Holdings is an ethical company. Right?” Howe pondered. “Yes, a remarkable — and shameful, frankly – disguise of justice in America…all the result of a company just like Enterprise Holdings forcing individual’s into courtroom where juries and appropriate judgements – including specifically punitive judgments – are entirely off limits. “It’s no wonder consumers are harmed so profoundly when a company like Enterprise can rig the justice system and disgrace due process so remarkably. “And make no mistake about it…I made an extraordinary effort to have the case transferred to the regular docket where I could have an attorney present – and a jury of my peers hear — the comprehensive evidence and proof of predatory behavior by Enterprise Car Rental and their untruthful employees. But it was all vigorously objected by Attorney Howard Citron representing Enterprise Holdings Corporation. I even did my best to file a motion to transfer…but, of course, Howard Citron wouldn't dare go in front of a jury. He wouldn't dare parade a host of Enterprise managers as witnesses in front of a jury of our peers that would instantly see the lies and contradictions stated to Judge Hayward but contradicted profoundly by FACTS uncovered by the police and sworn by the witness who willingly mastered a fairy story to Judge Hayward's face and the people of Lee County and beyond. “Moreover, at the time, I was completely ignorant about Florida statutes and specifically '90.803 Hearsay exceptions; availability of declarant immaterial'. Had I known about the statute, as well as how to articulate to the court the desire to provide Judge Hayward the detailed evidence produced by the police investigation, the ability for the defendant to create the remarkably untruthful fairy story in such dramatic terms would have been implicated instantly and with ease. “So, with all honor and respect, I urge the Supreme Court of the State of Florida to carefully consider this Pro Se plaintiff’s request to review the near impossible obstacles faced by an untrained litigant up against an ‘Officer of the Court’ who relished this unbalanced and unfair playing field to sham due process in a way never intended by our rule of justice. And if it’s indeed all my fault and all my error in judgment by not asking instead to know what other options to pursue when I learned that I could not obtain a trial in a court of proper jurisdiction with a level playing field, then so be it. “On the other hand, though, if there’s an ethical duty for the LEE COURT, and in particular, for an ‘OFFICER OF THE COURT’ – namely Howard L Citron to ensure that a non-attorney in a ‘SMALL CLAIM’ hearing has a fair playing field, then I’d appreciate if the HIGH COURT would swiftly and forcefully address this matter for the greater good of society…as well as the critical importance of DUE PROCESS and EQUITY in the United States of America. “However, if the failure of due process rests on my ignorance and decision to try in the case in ‘small claim’, then I nevertheless urge the Florida Supreme Court to review the ‘small claim’ process, particularly comparing Florida protocols and processes with that of the great state of California — where attorneys are generally not allowed and for good reason (https://www.dca.ca.gov/publications/small_claims/basic_info.shtml)…where the merits of the case trump the complicated rules of civil procedure which undeniably benefit one side over another when an attorney is involved…and where due process of law is consistent with the ‘spirit’ of a small claim hearing designed precisely for untrained litigants but otherwise shamed by EHI attorneys eager to cover up a forever obvious and undeniable bad act. SHAME ON ENTERPRISE HOLDINGS AND COMPANIES ALAMO AND NATIONAL. RENTERS OF THE WORLD BEWARE AND PLEASE AVOID THIS AGENCY AT ANY AND ALL COSTS!!! — DAVID HOWE, VICTIM AND SURVIVOR.